This is the million dollar question that many sufferers ask. 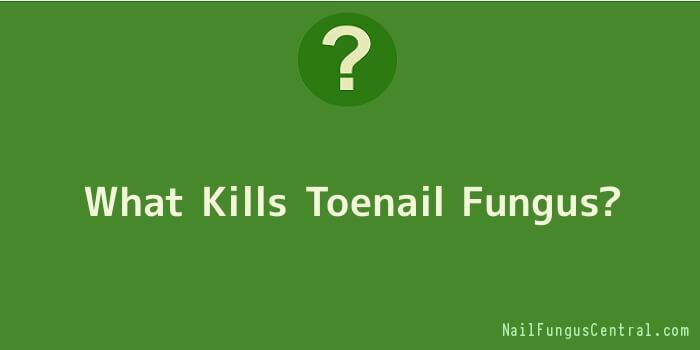 The first thing you should do is understand what causes toenail fungus. By understanding what causes it, you are better prepared to avoid it. Toenail Fungus, also known as onychomycosis, is caused by a small organism called a dermatophyte. It is also responsible for jock itch. Dermatophytes thrive in dark, damp, moist places and this makes the end of your shoes and the toe area a prime place for them to grow. They normally live under the nail and inside the nail bed but sometimes can be primarily a surface problem. Toenail fungus is also highly contagious. Contaminated gym floors, shower stalls, pool decks, and even carpets can all carry fungus spores. You should protect your feet whenever around these areas. When it comes to what kills toenail fungus, laser treatments are fast becoming very popular. They can be completed in just 45 minutes and are said to be quite effective. The drawback is the price tag at over $1000.00 U.S. dollars per session. There are various prescriptions that your doctor may offer to kill nail fungus. These are often taken orally (like Lamisil) or can also come in the form of a toenail lacquer or polish. Some of the oral medications are known to be very harsh and can even harm the liver. Topical solutions that use antifungal oils are also very popular. Many of these have proprietary formulas that include things like Melaleuca Oil, Almond, Oregano, and many other ingredients designed to fight against fungus.